This is too hard to navigate for 3 and 4-year olds, but fun learning for kindergartners. With JumpStart Pet Rescue, a Wii game targeted at kids ages 3 to 6, Knowledge Adventure has made good use their expertise in educational games to create fun activities where preschoolers can practice their ABCs, match numbers to grouped objects, learn colors by netting specifically-colored fish, and practice sorting by attributes. Knowledge Adventure has correctly identified that young children like to create avatars, own and play with virtual pets, explore colorful worlds full of talking animal friends, have books read out loud, watch videos, sing songs, and go on missions to rescue animals. What Knowledge Adventure didn't do well is figure out how most preschoolers interact comfortably with the Wii remote. It's too bad they didn't pay attention to the work done by others, particularly 2K Play in their development of the preschool Wii games Go Diego Go! : Safari Rescue and Dora the Explorer: Dora Saves the Snow Princess. By partnering with Nickelodeon, which did in-home research about how preschoolers could best use the Wii controllers, 2K Play was able to incorporate Wii-centric motions into their games that were intuitive to preschoolers. In the 2K Play preschool Wii games, kids play by turning Wii remote sideways and then simply tilting it left and right. In JumpStart Pet Rescue, preschoolers are asked to point the Wii remote at the screen to find a white arrow or a hand cursor. They are then asked to push the "A" button, and their avatar will walk to where they pointed. This method of navigation isn't as intuitive as simply tilting the Wii remote in the direction you want to go. Also problematic is the camera angle of looking over the shoulder of the child's avatar. In JumpStart Pet Rescue, the avatar frequently blocks the child's ability to see the cursor. Kids can use the up arrow on Control Pad to move forward, and the side arrows to move the camera angle; but this is pretty sophisticated stuff, and way past the abilities of most 3-year olds. Another frustration is that the game has long load times when you enter buildings and others locations, which forces impatient youngsters to wait for their gaming. It is really too bad that Knowledge Adventure flubbed the navigation for 3-year-olds and most 4-year-olds, because this game is otherwise spot-on for preschool learning and fun. It offers a big, brightly-colored 3D world to explore, filled with sparkling waterfalls, exciting jump pads, slides, and zip wire rides, and charming animal friends who help you to complete your missions. 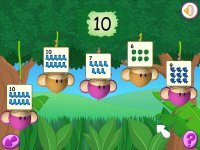 Older preschoolers and kindergartners can explore this game in two modes: Story and Explore. In Story mode, you are shepherded through five different locations with missions to complete in each. The overall theme of each mission is to accomplish tasks which earn parts to storybooks, and eventually find a missing pet. This mode is particularly good for kids who need direction in their play. The Explore mode gives you access to all five locations from the start, and you can have your avatar simply run around to find things to do. While educational games are sprinkled throughout the locations, most are centered in the Learning House. There you can choose which game you want to play and at what level of difficulty. The games span a wide range of early learning skills including matching, sorting, and following directions. They all offer fail-proof environments with lots of help built in. By playing the learning games, kids earn items to use in this world, including decorations and music CDs (which can be inserted into CD players to change the background music). Here's the bottom line: "JumpStart Pet Rescue" has good learning games, great missions, and lots of fun activities all set in an inviting virtual world. It's just hard to navigate and doesn't take much advantage of the Wii's motion controls; so choose it for older preschoolers and those in kindergarten. Age 5 or 6 is the sweet spot.